Before Jason Lopez joined the Glen Cove School District on Long Island in NY, district people who called 911 in the event of an emergency had to provide specific location details to the dispatcher. That meant relaying a possibly confusing set of instructions for getting around in schools with multiple hallways, floors, and buildings. Unlike a 911 call from a home, where the calling number provides the specific address where first responders need to be sent, calls from one of the six schools in the district would send emergency personnel to the billing address for the school--not always helpful for getting a speedy response. So one of the first actions undertaken by the senior systems engineer after he'd upgraded the district's data communications backbone and implemented a voice over IP system with about 300 phones was to sort out what was needed for enhanced 911, or e911. "I really wanted to know that if someone was having cardiac arrest or some other kind of problem, when 911 was dialed, [emergency responders] would know where that person was in this building with three floors on it," Lopez said. But implementing the system wasn't a simple process of ordering it up and putting it in place. Lopez had to work with county personnel, the educational cooperative his district participates in, and the Internet service provider the district uses. Lopez said he started the process by heading down to police headquarters to locate and introduce himself to the person who managed e911 for Nassau County, in which the district is located. Next he communicated with Nassau BOCES. This is the board of cooperative educational services in Glen Cove's region, which provides curriculum, instruction, and technology programs and services that run the gamut, from administrative office support to vision services. The district works through Nassau BOCES to purchase its voice service, which is provided by Optimum Lightpath, a division of Cablevision Systems. The technologist needed to persuade each entity to attend "a very big meeting," in which he could lay out his plans for implementing e911 for the district. The vendor Lopez expected to work with on the implementation--Cisco--was also invited to that session. Cisco had sold the district both a major switch that acted as the core router to direct wired and wireless network traffic and also CallManager, the IP telephony call system that provides voice over IP phone service. At that meeting Lopez presented his concerns about how the district's 911 calls were currently being handled. He knew that in an emergency any system that simply brought up the address being used for billing was insufficient. "If the emergency happened in an elementary school," he said, "they'd go all the way to the administration building. You'd lose time. Someone could die in a bigger incident." He also wanted to understand what information public safety people would need to see in their system when a call was placed. "Understandably, the police wanted to see a one-size-fits-all solution to e911," Lopez observed. The problem, he pointed out, is that manufacturers implement phone tracking differently, and companies don't always cooperate with each other. That makes large-scale e911 deployments pricey and problematic because getting the various pieces to work together can be hard. Next, Glen Cove acquired Cisco's Emergency Responder, an appliance that does real-time location tracking and enhanced routing, that supports notification of multiple people in the event that a 911 call is made, and that has built-in "intelligence" to detect and respond to IP phones that have been moved from one location to another. Lopez acquired blueprints of the buildings, which are the same ones used by the fire departments. 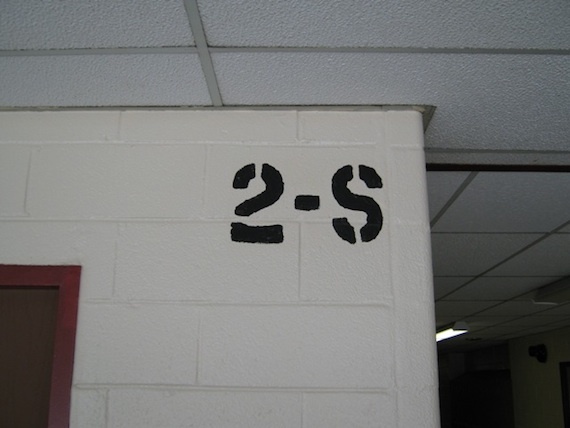 "They're not detailed," he explained, "but they do give you an idea of hallways and room numbers." Lopez and his team sectioned out each hallway as logically as they could and assigned each section an emergency response location (ERL), which was marked on hallway walls for easy identification. He took that information and cross-referenced it with the fire department on record for each school. Then he worked with the phone service provider, Lightpath, to register each ERL in a database that maintains the records of public safety answering points--the emergency dispatch centers. Finally, the switches were added to Emergency Responder. (The district started with a single Cisco 3560 power over Ethernet switch for each distribution frame for supporting the IP phone deployment. With time, the district invested in additional switches to support wireless access points, an IP public address system, and surveillance cameras.) "You section off ports to say, 'These 24 ports represent this ERL in this hallway.' When a phone is plugged into any of these 24 ports, it's the north hallway," explained Lopez. "It was a lot of legwork but well worth it." In the network closet the IT staff color-coded cabling to sort out functions. 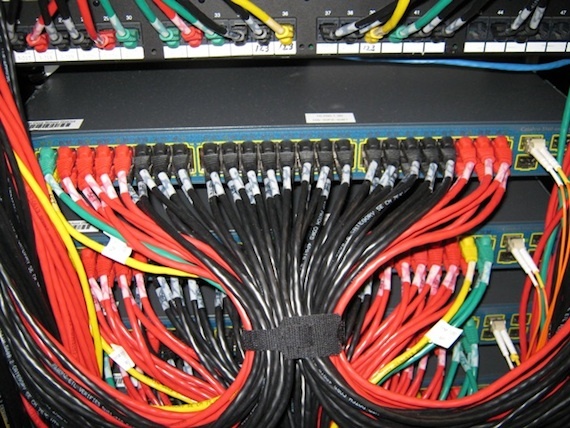 Green patch cables represent phones plugged into switches; yellow cables are wireless access points; black is used for computers; and so on. Once the setup was done, Lopez and his team could go into the software on Emergency Responder to view the phone number and the ERL and know exactly what school had made the call and what part of the school the call had come from. Now Lopez was ready to test the setup. That's where the relationships he'd formed with the police department came in handy. He'd call and say, "I'm going to be running a test in this window of time." He went to a sampling of phones for each ERL and called 911. On their end, the dispatch would pick up, say, "Hey, Jason, okay!" and hang up to free the line for a 911 call from the next phone. Making those calls took "weeks of time," Lopez recalled. "But once we were confident it was working, we just kept moving on through." Now, when an emergency occurs at one of the schools, not only will the first responders be notified, but they'll know exactly where to direct their efforts accurately and without delay. At the same time, others are informed--the principal of the school, the head of security for the district, the head of security for that particular building, and Lopez himself. Emergency Responder routes each call in three directions. First it uses speech to send a message stating that someone has called 911 and from what number. Second, it sends an e-mail alert to the specified group. Last, it redirects the call to 911 with a specified call-ID that can be routed back to the phone number that called 911. That number is then forwarded to the user's phone that placed the call in case emergency services needs to call the user back. When everything is over, Lopez will make a follow-up call. "I'll say, 'Is everything OK?' It's not my jurisdiction, but I want to make sure this wasn't a false alarm." Then he makes notes about the event in the Emergency Responder software. So far, he has logged 50 events, most from testing. Lopez advised other districts to go through the same basic process he followed to set up enhanced 911. "Find the people you need in your local police department. Talk to them. Tell them you're trying to set up a 911 system to protect all these people. They will be on your side. They'll want to work with you on this." He also recommended finding other IT professionals and vendors who have implemented the same technology under consideration by the district. After all, he pointed out, even though he's had experience in setting up e911 systems elsewhere, it's not something he does every day. "You don't want to take this on yourself," he said. "It's better to get more people involved, to find companies that might have done it." He said he believes that any voice over IP implementation should include e911 as part of the planning. In that regard, he suggested identifying how many phones are needed per closet, then adding five "to play it safe." When budget is an issue--and when isn't it?--he suggested reducing the number of power-over-Ethernet switches purchased since their utilization may not be high for the number of phones in place. "You might get away with one or two switches instead of five," he said. Then leverage the savings to purchase an e911 system and add those other switches at a later time. Once the system is in place and it has been thoroughly tested, Lopez recommended one last step: "You need to audit yourself. You need to review what you've done," he said. Checking over the system on a regularly scheduled basis is the only way to ensure that the ERLs still match up to the phones and that nothing has been unplugged. "We have many different closets and phones. It's possible that something was switched," he added. Although IT can find the general location of a phone based on its subnet, that kind of vagueness isn't good enough for Lopez. So far nothing truly serious has happened in the district. Most of the 911 calls made come from a school nurse because somebody was hurt on the playground. However, said, Lopez, "If something really bad were to happen, we'd be ready for that."